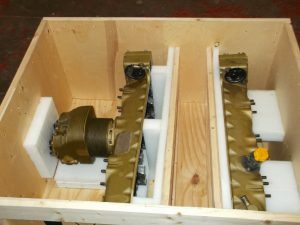 At Precision Box, we offer custom designed packing and crating solutions that are made to order. We have a wide range of specialist packing materials to suit specific customer requirements. These materials include barrier foil bags, desiccants, foam, humidity, impact, tilt and volatile corrosive indicators and anti-static shrouds and bags. Our aim at Precision Box is to customise our packing and crating solutions to individual customer item requirements and to ensure the safeguarding of your items by taking whatever packing precaution is necessary. Whatever your requirements, Precision Box can design customised packing and crating solutions for whatever item you need crated or packed. If you need items packed professionally, an expert member of the Precision Box team would be delighted to discuss your requirements and generate a quote for you. Not sure what your requirements are? Contact us today and let us assist you with our expert knowledge in the crating and packing industry.